Businesses that invest in user experience see significant increases in market share and customer retention and decreases in customer-acquisition, support, and training costs. Something is happening in the world of enterprise software development: design and user experience are becoming integral to business success. Over the last three years, IBM has hired over 1,000 designers globally and plans to hire 500 more by 2017. Venerable heritage brands such as Sotheby’s and Christie’s have plowed money into digital acquisitions and overhauls. From the very beginning at Amazon, Jeff Bezos has invested 100 times more cash in user experience than in advertising. However, for good design to transform business outcomes, good strategy must underpin it. According to a 2015 MIT Sloan report (PDF), digital strategy drives digital maturity, and UX strategy constitutes a significant part of that maturation process. Some business trends that have contributed to the importance of UX strategy today: the gap between consumer and enterprise software is getting smaller, and businesses have become omnichannel players. Implementing a UX strategy gives businesses the chance to reimagine themselves for a new era. Enterprise UX strategists must deal with some unique complexities. Despite the centrality of UX strategy to digital transformation and usable software, creating and implementing an enterprise UX strategy remains challenging. In addition to handling the usual challenges that face consumer UX strategists—such as analyzing subjective data, understanding complex user needs, and succeeding in a highly competitive industry—enterprise UX strategists must deal with some unique complexities. This article, which is based on the Justinmind ebook How to Make an Enterprise UX Friendly: A Quick Guide, considers the complexities of enterprise UX strategy, posits a general enterprise UX framework, and covers some tools and techniques that UX strategists employ, as well as do’s and don’ts for bringing UX strategy into a global enterprise. What Is Unique About an Enterprise UX Strategy? Enterprise UX strategy aims to improve the user experience for the actual user, who typically is not the buyer, while aligning with business goals and IT constraints. While enterprise UX strategy has much in common with consumer UX strategy, their divergence is in the details. For both enterprise and consumer UX strategies, the development of the strategy should always precede the design of a digital product. Plus, any UX strategy derives from a contextual, empirical analysis of the current situation and provides a high-level roadmap, showing how to achieve the stated goals. However, while consumer UX strategy aims to improve the experience for the buyer, who is usually the user as well, enterprise UX strategy aims to improve the user experience for the actual user, who typically is not the buyer, while aligning with business goals and IT constraints. The development of an enterprise UX strategy occurs in phases, over an extended period of time. To [create user-friendly software], you must base your UX strategy on user research rather than on stakeholder assumptions, consider … the enterprise’s strengths and weaknesses, and posit tactics a product team can employ. The objective of an enterprise UX strategy is to provide a roadmap for creating digital outputs that are more user friendly. To achieve this goal, you must base your UX strategy on user research rather than on stakeholder assumptions, consider the context of the enterprise’s strengths and weaknesses, and posit tactics a product team can employ. The necessary research and data-driven learning take place during the first, or discovery, phase. During discovery, consider the following questions: Who has requested a UX strategy and why? Was there a specific event that triggered demand for better a product user experience? Is productivity stagnant? Do training costs need to come down? Are customers abandoning your software at a certain point? Identifying the motivating factor behind the demand for better user experiences is the first step toward defining realistic success metrics—another aspect of a UX strategy. Discovery is also the time to conduct user research, identify the painpoints of your current software, and find profit leaks. A full usability assessment of the enterprise’s existing software and digital platforms uncovers common problems, while an analytics assessment reveals UX issues. What changes will the enterprise need to introduce or scale up to get the job done? It may be necessary to invest in resources such as new hardware or additional manpower or adopt new work processes or relevant tools to realize UX improvements. According to the MIT Sloan report Strategy, Not Technology, Drives Digital Transformation (PDF), digital transformations can change the very fabric of an organization. Employees must be ready to deal with such changes for a UX strategy to be successful. Contextual research and planning enable enterprise teams to differentiate between successful and unsuccessful user experiences and accurately position their design decisions and value innovations within the competitive marketplace. Things move very rapidly in the digital-product sector. So teams working on enterprise applications must be fully up to speed on digital-market shifts. Contextual research and planning enable enterprise teams to differentiate between successful and unsuccessful user experiences and accurately position their design decisions and value innovations within the competitive marketplace. For example, you should explicitly tie UX activities to go-to-market business objectives. Integrating a user-research perspective into existing competitive analyses and conducting an unbiased appraisal of the external context for an enterprise’s market performance are necessary to generating a shared product vision. Even the most complex enterprise can keep its UX strategy brief…. After research is complete, a UX strategy’s implementation phase begins. Even the most complex enterprise can keep its UX strategy brief—as short as two pages. While condensing all of the information you’ve gathered during the preceding two phases into a two-pager may sound challenging or even impossible, your UX strategy will be all the better for it. Figure 1 shows an example of a concise, clean enterprise UX strategy template from Justinmind’s ebook. Thanks to the clarity and brevity of this two-page strategy document, there is a high chance that internal stakeholders will read and absorb it. By holding a meeting to introduce the UX strategy to all of the stakeholders who are responsible for business and IT strategies, you can make the case for the UX strategy, get their feedback, and iteratively revise the two-pager’s content. Even experienced UX strategists can miss things sometimes—especially in complex enterprise contexts. 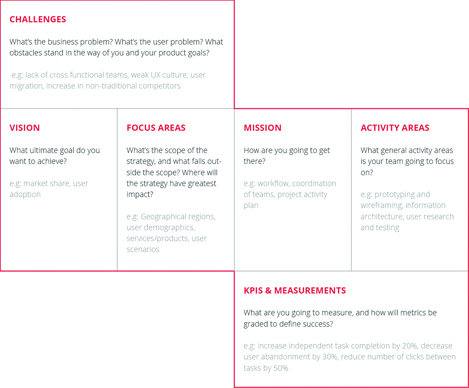 In an excerpt from her book UX Strategy on UXmatters, Jaime explains her approach to UX strategy and describes the Business Model Canvas, which outlines the nine essential building blocks of a business model. Whatever format an enterprise UX strategy follows, implementing the strategy will likely require organizational change. According to MIT Sloan, changing mindsets and processes is as important as creating a strategy. That’s one reason why the fourth and final implementation stage of enterprise UX strategy is so important. An organization’s adoption of a user-centric mindset is an ongoing process, which will help embed User Experience in the organization’s culture. Once you’ve created the UX strategy, make it visible by evangelizing it across the enterprise. An organization’s adoption of a user-centric mindset is an ongoing process, which will help embed User Experience in the organization’s culture. Optimizing a UX strategy requires continuous feedback and iterative improvement. Validating a UX strategy across globally dispersed teams and multiple departments is no easy feat. However, consensus-building techniques such as affinity mapping, mediated facilitation, and conflict assessment can help enterprise UX professionals to understand the painpoints around the implementation of a UX strategy. Consciously carrying out these activities will help the UX team to prototype minimum viable products (MVPs). A UX strategy should make it clear what metrics relate to specific success indicators and how they tie back to particular activities. Metrics are a key component of any UX strategy, and they’re one of the hardest things to get right. 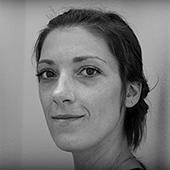 As Pamela Pavliscak wrote in her article “Choosing the Right Metrics for User Experience” on UXmatters, “Most metrics are marketing oriented, not experience oriented.” In an enterprise environment, conflicting stakeholder demands and highly complex systems further complicate the difficulty of collecting relevant metrics. Through a UX strategy, you can address potential confusion before it arises. A UX strategy should make it clear what metrics relate to specific success indicators and how they tie back to particular activities. Pavliscak has defined relevant UX metrics that you can adapt to an enterprise context by relating them to business goals. For example, a business that wants to cut internal training costs could measure the time to complete a task or the task success rate before and after a software update whose goal is to significantly improve these metrics. Specific business goals can, and should, translate to specific metrics, just as design solutions should support particular business goals. stakeholder interviews—These are central to defining UX strategy because they give a much clearer understanding of stakeholders’ multiple, and often conflicting, needs. Employ Kim Goodwin’s stakeholder interview checklist. user personas—It is essential to base personas on data from user research rather than on stakeholder assumptions. Personas based on data will have greater acceptance. prototypes—Creating a prototype helps your team to refine its understanding of the requirements that a UX strategy defines and gives everyone the opportunity to provide feedback. Prototyping tools such as Justinmind help streamline the design-test-iterate workflow. interaction models—Diagrammatic or other representations of the interactive behavior of key user segments can reveal opportunities for digital improvements to established processes. For example, Airbnb’s user journey represents an interaction model that has disrupted an established industry, and it hangs on a wall at their San Francisco headquarters. 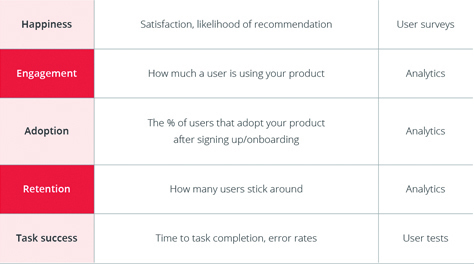 user interviews—Whether you follow a descriptive, inferential, or evaluative approach, user interviews help you to appreciate the impact of an existing product user experience, enabling you to strategize a better product. sector-expert interviews—These are particularly useful if you’re designing software for an industry with which you’re unfamiliar. Seek out key subject-matter experts and influencers and learn from them. competitive analysis—The only way to devise a strategy that enables an enterprise to beat its competitors is to review and analyze competitive products—whether Web applications or sites or mobile apps. The resulting report will be foundational in defining UX strategy. concept maps—Various types exist—for example, visual maps of users’ mental models of the processes they follow. HEART framework—This framework from Google is an outstanding tool for measuring and improving a released product’s user experience, as well as the success of a UX strategy against business metrics. The HEART acronym stands for Happiness, Engagement, Adoption, Retention, and Task Success. Figure 2 shows a simplified HEART framework. Google provides more in-depth information. You should abide by a few rules to ensure you create a UX strategy that works for users, stakeholders, and enterprise employees. Each enterprise UX strategy has unique details, depending on the enterprise’s target users, business goals, and market environment. But you should abide by a few rules to ensure you create a UX strategy that works for users, stakeholders, and enterprise employees. Create a conceptual guide, not a to-do list. Build the strategy on the bedrock of data and learnings. Include a competitive analysis to understand external threats and the business context. Keep your strategy document short and concise. Prototype and test, then revise your strategy as necessary. Expect the entire enterprise to adopt your strategy without a struggle. Write up a list of application features. The UX strategy reminds the team that what is good for the user is good for the enterprise. While it may seem like a lengthy, in-depth process just to come away with a two-page strategy document, an enterprise UX strategy is the organization’s North Star and captures key user requirements. The UX strategy reminds the team that what is good for the user is good for the enterprise. Creating and implementing a UX strategy inculcates good habits in an enterprise: the habits of design, user research, experimentation, and failing forward until systems become truly usable. By devising an evidence-based, cohesive UX strategy, an enterprise can succeed in the marketplace of the future. In contrast, enterprises that lack a UX strategy will fail in today’s new digital business reality. Thanks for a very good resource. I agree with separating user and consumer. (I think that’s pretty much UX versus CX—though I know many CX pros would eat me alive for that.) I also see enterprise and product UX strategy as very different from what I think you do. I see it as internal, organizational strategy. Usually change management at the organization level versus product or brand UX, where contextual and competitive analysis and actual experience design come into play. Some companies are hard to separate that way—the organization is the product, which is the brand. But I find it useful to at least understand which level we are dealing with at a given moment—even when it’s all 3 simultaneously. Hi Nik, glad you like the eBook. Yes, change management—and managing expectations!—is a huge part of successful strategy implementation. Interesting take on it—to think about the enterprise as a product.